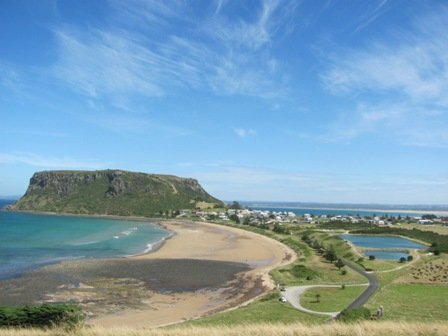 Tasmania: Another great birding holiday destination! We have just returned from a 3-week camping holiday in Tasmania and it was every bit as good as our last visit 2 years ago, which was for a month. We had such a good time then that we just had to return and this is the best time of year to visit from a temperature point of view! When you live in the tropics you do tend to notice the cold, so a temperature range of 10c-25c is ideal. You get to wear some winter clothes and snuggle down in a cosy tent at the end of the day. It is light until about 9pm, so when you sleep in it really doesn’t matter! On our last and first visit to Tasmania we went to all of the National Parks that we could and this time we focused on the State reserves and State forests as well as the coastal areas and we were equally impressed with what is on offer. We covered 3035kms at an average speed of 67km/hr due to the windy roads! I think if you were brave enough to tackle Tasmania by bicycle, which many people do, you would average 6.7km/hr! Did I mention the hills! There is a free map for cyclists with all inclines and declines marked on-how depressing would that be to look at each day-as you realise that this little Australian State is not as little as you thought and it’s definitely not flat! From Broome we flew via Perth and Sydney and did manage to add a few new species to our year list and arrived in Hobart a full 24 hours after we left Broome. The Tasmanian Native-hen is easily observed around the airport and we then travelled south to the Peter Murrell reserve to see the Forty-spotted Pardalote. We could hardly believe it when we had one land in front of the car before we even got out! 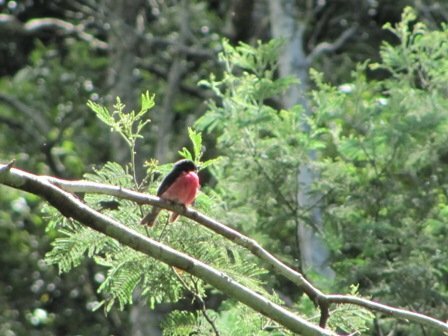 Snug Falls is close by and a lovely walk which has produced both Pink Robins and Strong-billed Honeyeaters on both visits. The biggest dilemma I faced every day was “Do I look at this bird for a bit longer or stop looking and get a photograph?” Well, I did get a photo or two of the Pink Robin at Snug Falls! We drove north through Oatlands and Ross this time instead of up the coast and then followed the windy road to Fingal and camped in the Griffin Forest reserve. Another windy road got us to the coast and we visited the Winifred Curtis Reserve at Scamander. On our last visit it had just been burnt and on this visit it had just been flooded! We ventured north to St Helen’s where we saw our first Hooded Plovers and Ruddy Turnstones in the Conservation area. More windy roads took us west via Scottsdale through Lilydale and to the City of Launceston. Launceston has some great parks and the most famous is the Cataract Gorge right on it’s doorstep. There is also the Tamar Island Wetland Centre, which protects an area on the west side or the Tamar River. 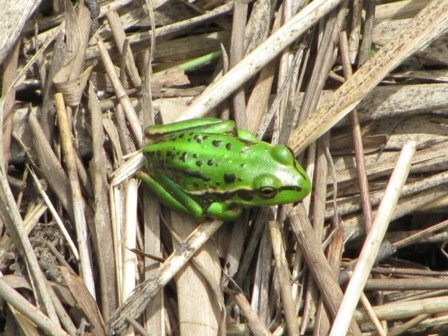 We saw Green and Gold Frogs there, which have had a tremendous decline in population over recent years. The wetland is popular with the Masked Lapwing and hundreds were feeding on the mud on low tide. 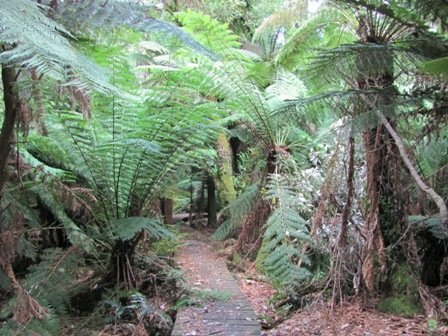 Notely Fern Gorge is an amazing place for those of you interested in tree ferns, but even if you are not you would truly be impressed. There are also so many waterfalls that I can hardly mention them all! 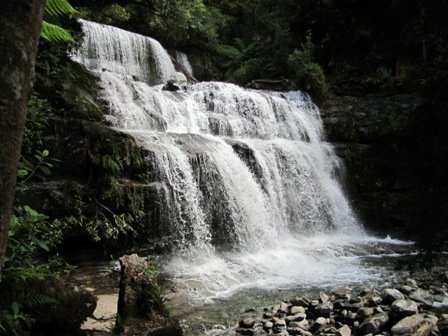 Liffey Falls is very popular to the south-west of Launceston and a spectacular drive past Quamby Bluff to get there. A lot of this area was hit in the recent floods and the damage to roads and riverside picnic areas was quite incredible. We visited Stanley once again, as last time we had experienced hail at the same time of year whilst climbing the famous “Nut”. The “Penguin crossing” sign had been changed as it had most likely been stolen as a souvenir! It was a beautiful sunny day and we had such great views all around. 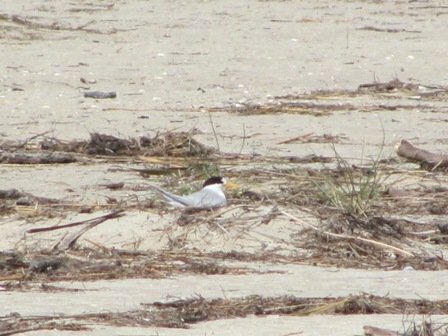 The beaches nearby had breeding Fairy Terns and Hooded Plovers. 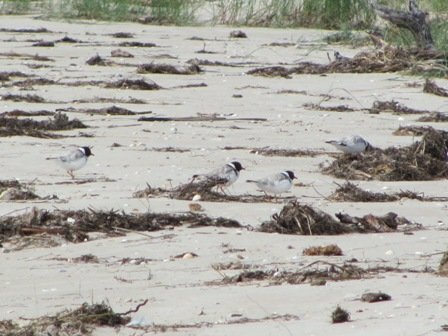 There were also good numbers of both Pied and Sooty Oystercatchers. It felt quite strange to walk the sandy beaches with shoes and socks on-you just do not need to keep your feet warm in Broome! Our trip south back to Hobart this time was through the middle of Tasmania and the Great Lake, Bothwell and then to New Norfolk. 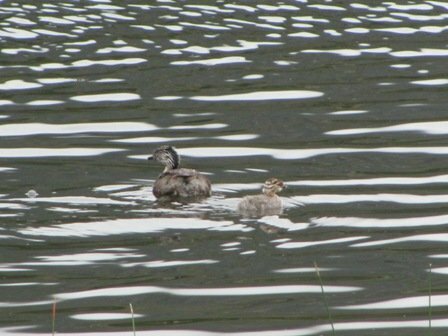 We then drove back to the city along the northern side of the Derwent river to return to Risdon Brook Dam, which is an excellent place to see Scarlet Robins and there were several Hoary-headed Grebe with young. Of course you are wondering if we saw anything dangerous-well, yes, four Tiger Snakes! 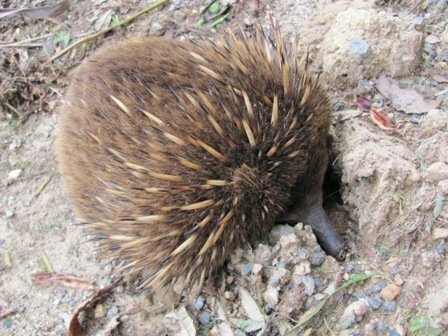 We were more impressed by the Echidna, though and they have adapted to the cooler climate with more hair/fur and less spikes than the Victorian variety. We came back with so many photos and such good memories from both last time and this time it is incredibly hard to know what to share, but we hope that you all get a chance one day to visit that little hilly, windy road state of Tasmania! Consider the time of year you visit, though, as it can be rather cold in winter-it’s summer now! Thanks for sharing so much excellent information about a place we Americans consider quite exotic. Pink Robins and Hoary-headed Grebes are all well and good, but that Echidna is awesome! @Mike: the curse of Australia’s avifauna seems to be having to compete with so many other impressive/neat/highly dangerous creatures and critters. Did you get a picture of one of the tiger snakes? Yes, the cyclists looked German!! We didn’t get a snake photo this time! I meant thread, not threat – although in this context, threat may not have been too far off.